FK Lowry Piling delivered part of the foundation works on DBFO2. DBFO Package 2 is Northern Ireland’s largest ever roads PPP project. The 30-year £250 million DBFO scheme was delivered by Amey Lagan Roads Ltd, a consortium of Amey and Lagan. Lagan Ferrovial, a joint venture between Lagan Specialist Contracting Group and Ferrovial Agroman Ireland, was responsible for the construction package on the project. The scale and complexity of the project was significant. Scheme 1 alone included twenty new structures – from an agricultural underpass to a 109 metre long viaduct – whilst Scheme 2 included two over-bridges and two underpasses. Scheme 3 incorporated a further twenty-two new structures – including a 50 metre span composite bridge. 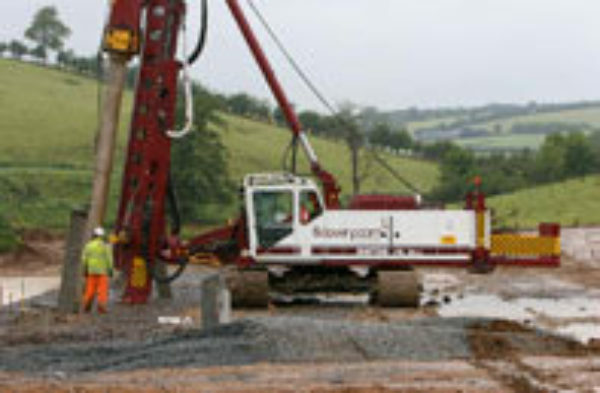 FK Lowry Piling delivered the foundation package over three phases – two phases of CFA piles to form the retaining wall for the underpass at Loughbrickland (using Junttan 18-30 rig), together worth £120,000, and one phase of precast piling (PM 20 rig) required for bridge abutments on the road, valued at £250,000. On the latter phase the precast piles were installed over a peat bog over which an earth embankment was constructed to support part of the new road. Two rigs were employed to drive 1,154 concrete piles of 270mm2 and 355mm2. FK Lowry Piling also installed the pile caps and cross beams on the piles to support the ‘load transfer platform’ on which the embankment was constructed. The pile caps were cast on site, while the cross beams were precast at our yard in Lisburn and later installed on site. Due to the nature of the load transfer platform, particular care and attention was required by the crews to ensure the piles were installed as close to vertical as possible, since eccentric loads could have caused problems with the design.